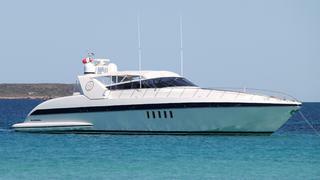 Giulio Riggio at Fraser Yachts tells me he's brought the 25.07m motor yacht Canea back to the market. Delivered by Overmarine in 1998, she’s one of their Mangusta 80 Open range of superyachts, sleeping six guests in master, VIP and twin staterooms with accommodation for two crew in a twin cabin. With only 720 hours on her original engines, she cruises at 35 knots, with a range of 350 nautical miles. Ready for inspection in Palma de Mallorca, Canea is asking €680,000, VAT paid.